The 1840 tithe map for the parish of Llyswen reveals something unusual. The map shows a large area of narrow strip fields, and the records which go with the map call this area the "Common Field". In medieval times arable land was divided up into narrow strips and divided up between the villagers. Each villager got the same number of strips, and these were spread out so that everyone got a share of the better and poorer land. Villagers could also graze their animals on the open common pasture. 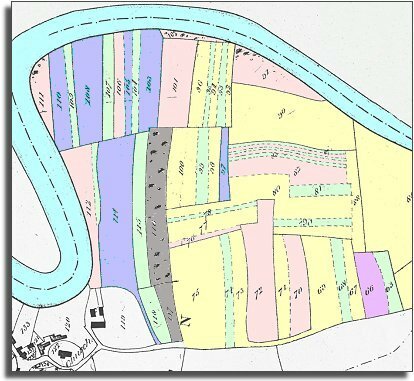 The map below shows this ancient system still in use in 1840 in Llyswen. We have coloured in the strips so you can see who held what land. The table underneath gives the names. In Victorian times almost everyone had to pay tithes to the Church of England. At the beginning of the reign the tithe became a tax on your property. The maps were drawn to see what property everybody had. The strips of Mr William Jones of Lower House Farm. Most of the people above did not own their own farms but were tenants. Upper and Lower House Farms both belonged to Sir Charles Morgan, and local estates like Maesllwch and Llangoed owned large estates.